Instead of asking who Quiet Village is, we might begin by asking what, or better, where. Naggingly familiar, it sounds like the name of a place glimpsed in a film, or perhaps a dream. And that's just about right. For Quiet Village?the group, that is?make music inspired by classic soundtracks, vintage TV adverts and long-forgotten BBC programs, triggering an emotional response so deep-seated it's practically subliminal. The name Quiet Village, of course, comes from Martin Denny's classic album of exotica, and appropriately so, for the members of Quiet Village might first and foremost be described as archivists?record nerds intent upon forging a shimmering totality from their sagging shelves of vinyl. 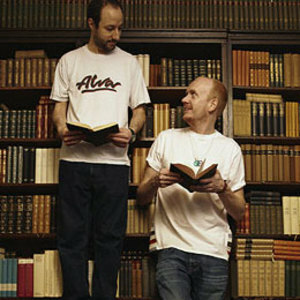 The group consists of Joel Martin, a longtime record collector, curator, DJ and music supervisor, and Matt Edwards, the house and techno producer best known as Radio Slave. The two met in the early '90s in the town of Catford, England, southeast of London, where they bonded?in a car headed for a Metalheadz gig in London, as it happened?over a shared love of old disco, acid house and carboot sales. "I'd go hang out in Matt's studio and we'd just listen to music," remembers Joel. "I'd sit in the studio with him while he was producing, playing each other stuff that we liked, turning each other on to music. But we never expected to make music! That was never in the cards." But cards have a way of getting shuffled. In one of those strokes of luck that make amateur diggers gnash their teeth, Joel scored a massive collection of library records?collections of background music intended for TV production, from lite jazz to avant-garde electronics?from a branch of the BBC that was closing down, to the tune of about 40 quid. They initially planned to create a compilation featuring the best bits from Joel's haul. (The two even founded a label, Heroes & Villains, on which they went on to release 2001's Harlem World: The Sound of the Big Apple Rappin', compiled by their digging buddy Mark B.) But their ambitions quickly amplified. Listening sessions turned into mixing sessions as Matt and Joel's DJ sensibilities began to mesh. By the turn of the decade, Matt's solo career had taken off, first with a legendary series of hip-hop and R&B re-edits, and then as an acclaimed producer of high-octane house and techno, tapped for remixes by the likes of X-Press 2, Tiga, Kylie, Hell, Booka Shade, Moby, Trentem?ller and more. Joel, meanwhile, was applying his background as a film editor to projects like the music supervision for the film Shaun of the Dead and the compilation album Dawn of the Dead: The Unreleased Score, featuring the original library-music cues used in the groundbreaking zombie flick. "Through me doing my solo work, I became more confident in producing," says Matt. "So I could actually sit down with Joel and we could make music. Both of us could be creatively productive in the studio." Matt was living in Brighton by then; Joel, in London, would come down "for two or three days at a time, or a week, and we'd have a brainstorming session," he says. "We'd work on stuff and just kind of let it happen." In 2005, having formalized their collaboration with the name Quiet Village Project, they released two singles for New York's Whatever We Want Records, home to disco deviants like Map of Africa and Godsy. A third EP followed in 2006, as well as remixes for Cosmo Vitelli and the Osmonds (yes, those Osmonds), among others, while 2007 brought remixes for MUDD, Toby Tobias, Black Devil and dance-music legend Fran&ccedil;ois K, whose iconic Deep Space party has served several times as the proving ground for Quiet Village's unconventional DJ styles. All the while, Quiet Village were hard at work on the cuts that make up their debut album. Dropping "Project" from their name marks a break with their career so far. It's a subtle one, perhaps, but significant nonetheless. While they're still known as disco aficionados and crackerjack dancefloor DJs, Silent Movie is something else. This is not "nu-disco." It's not some "Balearic" ballyhoo. Nor is it Music for Films redux, despite the cinematic suggestion of gauzy sunsets (and the possibility of zombies lurking in the wings). It's a grand and occasionally goofy collage of styles and ideas, something that can only be described as the Quiet Village sound. Bluesy guitar, chamber strings, air-raid sirens, shuffling breakbeats, muted trumpets, reggae lilt: it all gets smeared into an hourlong reverie as seen through a Vaseline-coated lens, slightly somber and unusually inspired.